A comfortable eight wicket win against the Sydney Thunder on Tuesday night at the Docklands gave the red army its first victory for BBL|04. Having lost the toss and being asked to bowl by the Thunder, the Renegades looked hungry in the field, and with the ball. James Pattinson made his return with a bang, snaring 3/24 off his four overs. Better yet, all his wickets – Jacques Kallis, Michael Hussey and Andrew McDonald – were all clean bowled, and all were out for under 11 runs. With a remodelled action, as was mooted before the game by sections of the cricket cauldron, Pattinson’s return earmarked the start of a roll the Thunder could never get away from. Aiden Blizzard, the man who almost single-handedly dragged the Thunder over the line against the Sixers in their previous match, put the ball straight down Matt Short’s throat. At 4/39 in the 8th over, the pickings for the Thunder were slim. Eoin Morgan, England’s new one-day and World Cup captain, couldn’t push through the start barrier either, slicing an easy catch straight to Callum Ferguson. Daniel Hughes and Chris Hartley mustered a 51 run partnership, but no boundaries between the fifth and fifteenth overs irreparably dented the Thunder innings. Dwayne Bravo was at his calypso best to run Hartley out in the second last over, diving forward with his boot to kick the ball onto the stumps. Signs were ominous, especially after the clinical force the Renegades used to put the sword to the Thunder’s throat. Needing just 115 to win, the men in green had to find their A-Game and take it to the Renegades, to avoid slipping further after their big first-up win against the Brisbane Heat before Christmas. 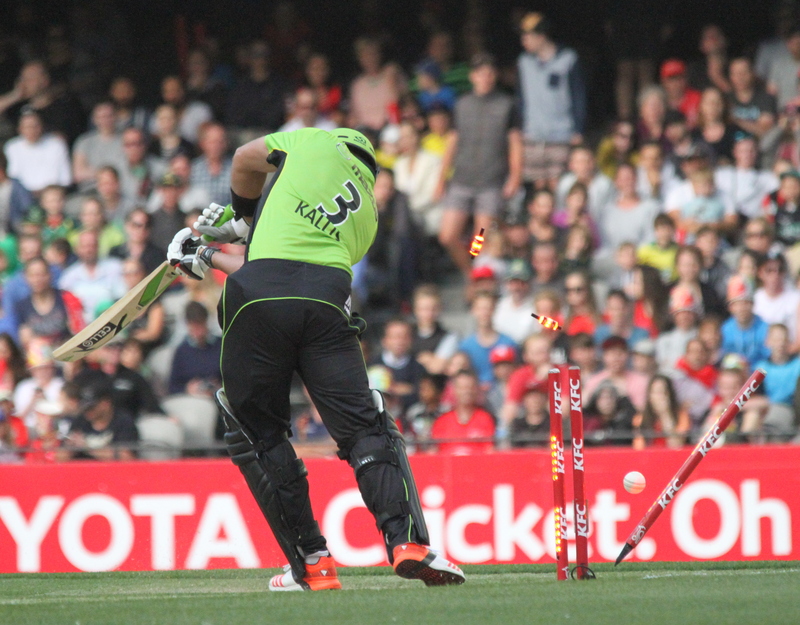 Dirk Nannes sent Matthew Wade’s bails flying in the fourth over, but the damage was almost done. The Renegades were well ahead of the run rate, and with a powerful batting depth, barely blinked an eyelid at the loss of their keeper. Aaron Finch (48 off 37) smacked eight fours, and Callum Ferguson (30 from 24) ably supported the Renegades captain to guide them within 20 runs of the target before Finch was dismissed off the bowling of Nathan Hauritz. That partnership was enough, just a few overs later, to see them over the line. Andre Russell, after his phenomenal hitting against the Perth Scorchers on Boxing Day, had no opportunity to replicate his feats for the Etihad crowd. No matter how hard the Thunder tried, the Renegades resisted easily. Kallis (0/13 from 3 overs) was the most economical of the bowlers, while Nannes’ economy rate was pushed out to nine runs an over. On the other side of the card, after two disappointing losses, the Renegades not only looked at home, they were home. They played the powerplay better than the Thunder. Where Sydney couldn’t pick the gaps, Melbourne did. Bowling in the blockhole, the Renegades also won that battle. Before the game, Cricket NSW media manager Malcolm Conn noted that the experience of the Thunder line-up had them in good confidence in the dressing room. They now slip to 1-2 after three games, and with their next opponent, the Perth Scorchers, undefeated, the New Years Day clash with them at home makes a win for the Thunder even more important. The Renegades do not play again until Saturday’s derby with the Melbourne Stars, but will go into the game favourites on paper and favourites on the odds.